Just in time for summer, Bumble and Bumble teamed up with the swimwear brand Sold & Striped to design two new limited editions of their infamous Surf Spray! Inspired by iconic beaches, Montauk and Malibu, the products were created with to give you the aura and style that each coast embodies. Though each spray creates the same sea-tossed texture you love, they have their own special scent, uniquely created to compliment their city. Montauk Dunes spray is a fresh, floral blend of Lily of the Valley and Dewy Greens; while Malibu Beach is a coconut, orange, and red fruits-spiked tropical scent. Both may be used on fine to medium hair, straight or wavy textures. This special, limited edition Surf Spray is sure to be a favorite this summer. Stop in to purchase soon while supplies last! The 2018 Sustainable Beauty Month goal aims to plant 5,000 fruit trees in the remote Loreto region of Peru. These trees will serve as a stable source of food and income for over 350 families living in the region. We can't think of anything more rewarding than knowing our efforts here will directly impact these families for years to come. So, how does Citrine plan to contribute to the tree planting effort in this impoverished region of Peru? This month, we're celebrating the arrival of Spring and Earth Day by partnering with Davines as part of their annual Beauty Sustainability Month! Every year the Italian hair care line, Davines, confronts a challenge experienced by the less fortunate living on this beautiful planet. We look forward to joining Davines in contributing to global and environmental affairs, as we all know that even the smallest of efforts create noticeable change. Beauty Sustainability Month is a unique movement, as Davines and salons join forces in a cross-section between business and the environment we live in and love. This year, Citrine Salon will be assisting Davines in their mission with the Fruit Tree Planting Foundation. This month, we will be holding a raffle for a gift basket filled with some of the best-selling Davines hair and body care products. With the purchase of a 5 dollar ticket, your name will be entered into the drawing for a gift basket worth more than 75 dollars! All proceeds will go directly to the Fruit Tree Planting Foundation at the end of the month. At that time, we will draw a name as well. Stop in this April for more information or to purchase a ticket, or simply follow the link below to donate. Happy Sustainable Beauty Month! This week we're excited to introduce the newest addition to the Bumble and bumble hair care family. We've seen quite a few exciting changes and innovations from Bumble and bumble this past year, and are certain this next installation will not disappoint! 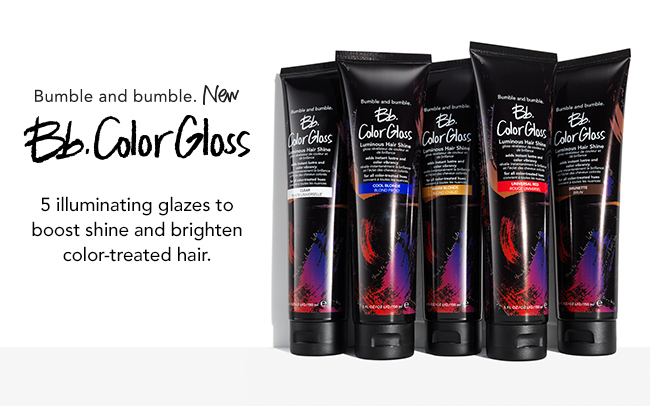 Introducing Bb Color Gloss- five illuminating glazes to instantly boost shine and revive color treated hair. From pink to brown, black to platinum blonde (even white! ), Bumble and bumble has crafted an easy color pick-me-up that quickly deposits vivid and dimensional hues to brighten and illuminate any shade of hair. Available in brunette, warm blonde, cool blonde, red, and clear, Bumble and bumble's Color Gloss delivers shine and renewed color for up to three washes. Suitable for all hair types, Color Gloss enlivens high lights, low lights, single process colors, and everything in between (yes, this includes any rainbow color, too!). What's better is how easy it is to achieve a fresh color. Simply apply the desired gloss to dry hair and leave on for 20 minutes, then rinse. Follow with your favorite color safe (or any) shampoo and conditioner. That's it! We're going to love this product for use in-between color appointments, when color begins to lose its vibrancy and shine. Yellow and brassy tones are instantly neutralized, keeping highlights and lighter tones cool and true. The conditioning effect of Color Gloss will add luster and dimension to your locks, creating all the shine you'll ever want!